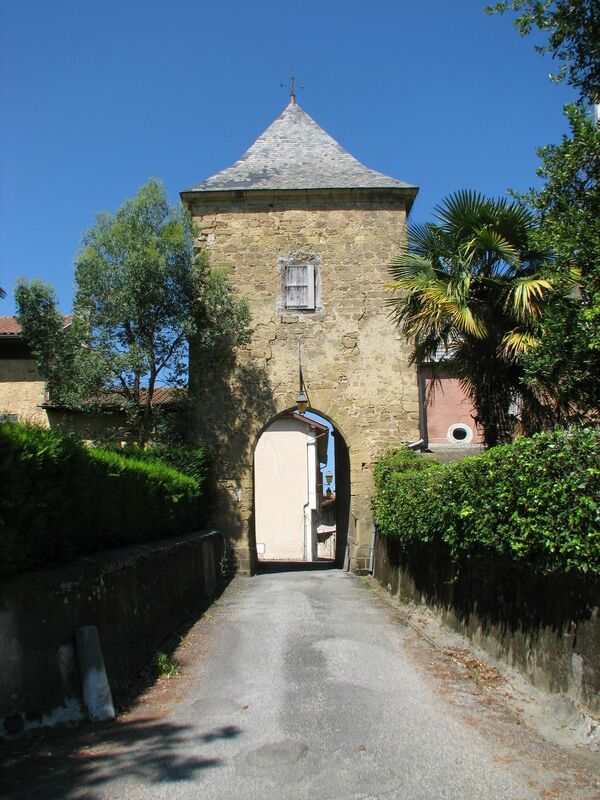 As a walled town, the main street of Galan was kept safe by two large doors, which were closed each evening. It is the southern gate tower (probably dating back to the 13th century) which is the last visible sign of the village’s walled past. This perfectly preserved fortified tower is a 6.2m x 5.5m stone construction. It has a large arched doorway 2.4m wide and more than 3m high. There are several stone supports visible in the upper part of the wall near the archway (perhaps where there used to be a floor). Another stone support, in the centre above the gateway, was doubtless used as a base for a statue of a patron saint, as was customary at that time. The first floor would have been accessed by a narrow door and a staircase and in here was a dark room. The slate roof that we can see today was installed in more modern times. The door was preceded by a now-vanished drawbridge. Galan’s Southern gate tower was designated a French historic monument under the historic monuments act of 13th March 1946. 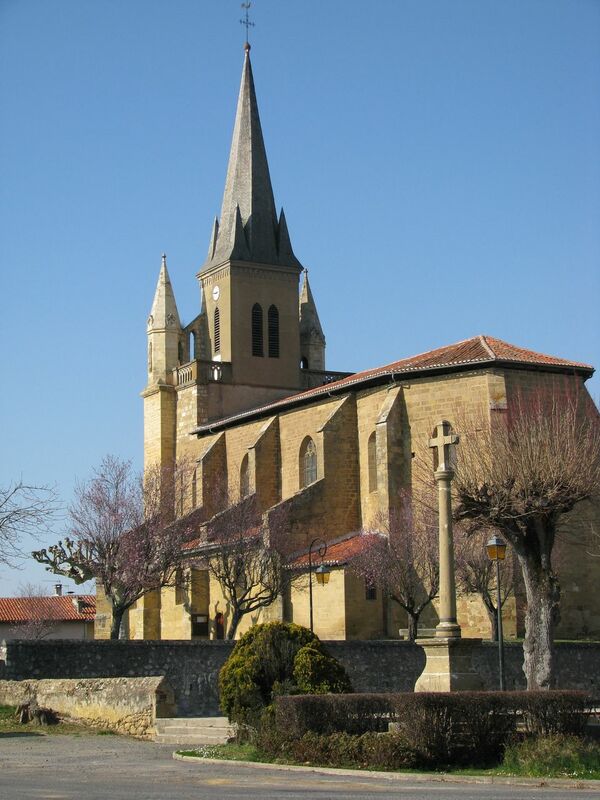 Formerly a priory church, the church of Saint-Julien de Brioude became a parish church in 1670. Construction started at the beginning of the 11th century, presumably by Rochifert, and since then the architecture of this church has evolved over the centuries. The bell tower, originally made of wood with three spires, was destroyed on 2nd March 1868 following a lightning strike and subsequent fire. It was rebuilt in the form of a large pyramid-shaped spire with a hexagonal base, measuring 16m, thus taking the total height of the church up to 43.2m. From an architectural point of view, the church is dominated by the two main styles of the Middle Ages: Romanesque and Gothic. The most striking examples of Romanesque architecture are the size of the stones and the cylindrical pillars separating the three naves inside the church. Another interesting feature is the two doors on the western façade, which are built with broken arches. These were common at the end of the 11th century and were also typical of the Gothic style of the 14th and 15th centuries. It is certainly the Gothic style which dominates and is most notable in the interior vaults and also in the presence of crossed arches marked by carved keystones. The church has two other very rare elements: the presence of medieval wall paintings and numerous stained glass windows representing Saints (both very unusual for churches of this type in rural areas). The building has been included in the inventory of historic French monuments since 14th March 1944. The origin of this building, like the rest of Galan, probably dates back to the Middle Ages, perhaps the 14th century, but there is no written evidence to support this. 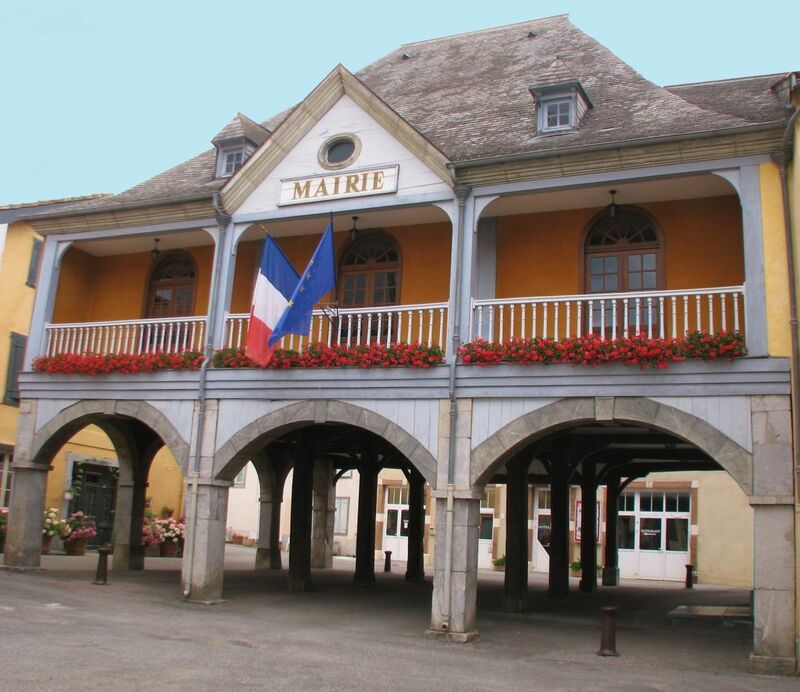 It was not until the years 1784 and 1786 that the mayoral hall, called the « common house », officially appeared on the local land registry established by Laurent Lafosse, surveyor of Villeneuve de Riviere. It is also recorded that on February 15th, 1802, Galan’s local council were worried about finding ways to rebuild the deteriorating common house. These worries remained unanswered until 1816 when a reconstruction project was proposed by Joseph Galan, a carpenter in Lannemezan. 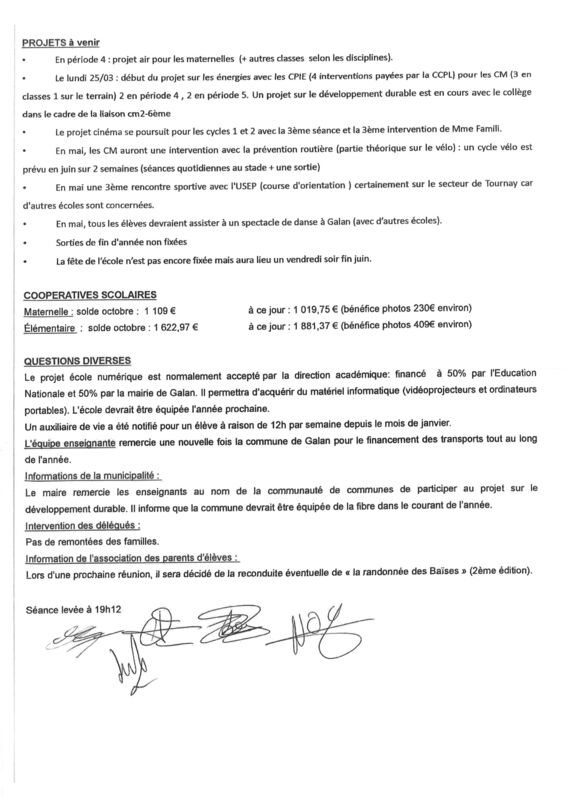 In fact, this proposal was superceded by another project, initiated two years later, by Jean Bazerque, an architect from Sarrancolin, who proposed several improvements that can still be seen today; including six stone pillars, a slate roof, three wooden arches and a mock-marble painting. From 1821 to 1958, the building had many different uses besides local council meetings; village events commonly took place here, as did legal proceedings by the justice of the peace, regional assemblies, the boys’ school used the first floor and every Thursday there was a market underneath the arches. During this period, several improvements and restorations were made to make the village hall more aesthetically pleasing, including the installation of cobblestones in 1838 and an improved ceiling under the first floor in 1876. However, despite these improvements, in 1904 a local architect, Mr Labat, drew up a report which stated that the building was in a state of total decay and at risk of collapse. As a result, several building contractors in Galan and the surrounding area carried out renovation projects, including the consolidation of the building’s structure, the re-fitting of two offices, the reconstruction of the staircase and floors, as well as the continual refreshing of the interior and exterior paintwork and plastering. In 1958, the building was officially re-named the « old town hall » and stopped being used for council meetings. Twenty years later, there were calls for the total demolition of the building. However, after much deliberation, more renovation work was undertaken and on the 5th February 1994 it again became the official offices of Galan’s Mayor. It was officially inaugurated some time later in the presence of the Minister of Culture of the time, Mr Philippe Douste-Blazy. On the 11th October 1984, Galan’s Mayoral Hall was entered in the records of French historic monuments.